Applegarth, Merlin House Holiday Apartments in Blue Anchor, near Minehead sleeps 6 people. These two holiday apartments (refs 29565 and 29566 [Lancelot]) are adjacent to the owner’s house and located in the coastal village of Blue Anchor. Well-appointed and presented, the apartments are ideal for those looking for a comfortable haven whilst exploring this delightful area of Somerset. The apartments benefit from a shared garden and hot tub with views over the Bristol Channel and the renowned West Somerset Railway. The properties are located a short walk from Blue Anchor Beach, the sandy part is tidal, and the Blue Anchor Station for the steam railway. There are also local shops, pub and restaurants within walking distance. Further beaches can be found at Dunster and Porlock. There is superb scenery and walking on the South West Coastal Path or inland on Exmoor. Visit the Victorian villages of Lynmouth and Lynton, famous for the Watersmeet Gorge (National Trust), Valley of the Rocks and the funicular cliff railway. Enjoy a walk and an ice cream on the promenade at Minehead, which also has a good array of shops. The West Somerset Railway is worth a visit for those with an interest in steam engines. Dunster Castle (National Trust) with its beautiful terraced gardens, deer park and mill, or Porlock Weir make for an interesting day out. Beach 200 yards, cafe 400 yards and swimming pool 500 yards. Shop 500 yards, pubs and restaurant ½ mile. All on ground floor: Living room. Dining room/kitchen. 2 double bedrooms (one 5ft), one with additional bunk (for children). Bathroom with shower over bath and toilet. 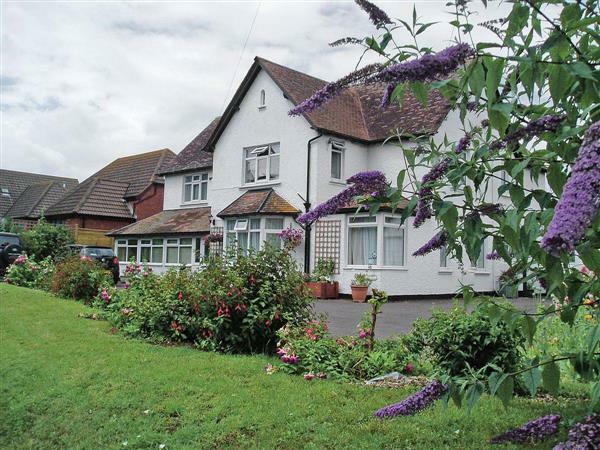 Both properties: Gas central heating, electric and bed linen included. Cot and high-chair on request. Freeview TV. DVD. CD. Electric cooker. Microwave. Shared laundry room with w/machine and t/dryer (honesty box). Fridge/Freezer. Wi-Fi. Patio with furniture. Shared landscaped grounds with sitting-out area and furniture. Shared Bar-be-que. Parking (1 car). Shared hot tub (10am-10pm, Apr-Oct). Welcome pack. No smoking. Easy walking access. NB: Pond in grounds. Holidays at Applegarth, Merlin House Holiday Apartments run from Saturday to Saturday. For a better idea of where Merlin House Holiday Apartments - Applegarth is, you can see Merlin House Holiday Apartments - Applegarth on the map below. Merlin House Holiday Apartments - Applegarth is in Somerset; should you be on the lookout for a special offer, you can find all the special offers in Somerset. It's always worth checking to see what is on offer at the moment. Do you want to holiday near Merlin House Holiday Apartments - Applegarth (29565), you can see other cottages within 25 miles of Merlin House Holiday Apartments - Applegarth; have a look to find your perfect holiday location.